Coin toss determines who kicks first or second. We recommend the referee chooses which goal the kicks will be taken at before the game with the governing sports authority. 10 different kickers are selected. If all 10 kickers take kicks, the order of taking kicks must be repeated. The goalkeeper may not be replaced during the taking of kicks unless injured. The injury must be verified by an attending physician or certified trainer with approval from the governing sports authority. Player eligibility is to be determined by the governing sports authority. In some cases, coaches will ask the referee team whether a player is eligible to play because of their accumulated cautions. Please review the referenced rule and be prepared to advise the governing sports authority representative accordingly. If there’s any doubt or question about a player’s eligibility, allow the player to participate and file a report with the governing sports authority. 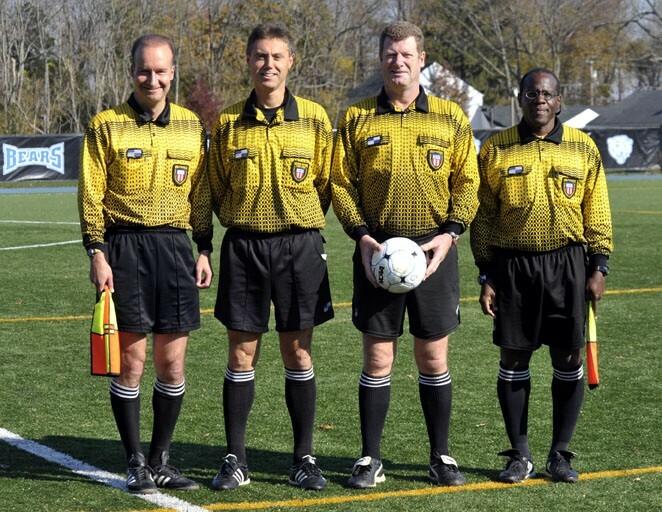 The 2010 NISOA National Referee Program Clinic has been scheduled for July 9-11, 2010 at Elizabethtown College in Elizabethtown, Pennsylvania. Other clinic dates are June 4-6, 2010 at Azusa Pacific University in Azusa, California and June 18-20, 2010 at the University of Oklahoma in Norman, Oklahoma. Interested NISOA soccer officials should begin by downloading the appropriate documents, completing as directed, and forwarding them to their correct Regional Area Coordinator (Mark Butler is our Region II coordinator) by March 1, 2010.